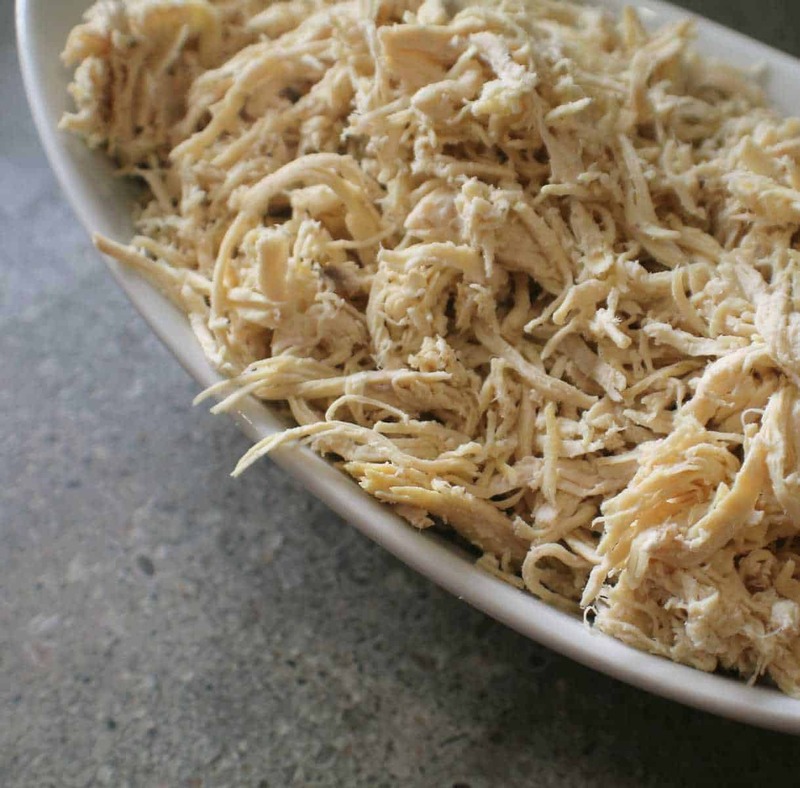 Having a good shredded chicken recipe to use in soups, stews, casseroles, or for meal prep is essential. I used to skip over recipes that called for cooked chicken because it seemed like so much work – especially if I only had frozen chicken – but no more! 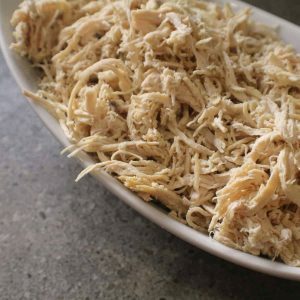 I have 2 methods below that will outline how to make perfectly cooked shredded chicken in the oven or in the Instant Pot that are fast, easy, and make dinner a breeze. No more skipping recipes that call for shredded chicken! Plus, in both methods you can use frozen chicken – woot woot! First, take the chicken out of the packaging and place in a very large bowl or container. Then cover chicken with cold water for 20 – 30 minutes or until thawed. Then, place chicken in a small baking dish and season with salt and pepper. Add 1/4 C of water and cover with foil or oven proof lid. Bake at 375 degrees for 25 -35 minutes or until cooked through. It will look really unappetizing when you first take it out of the oven, but hang in there with me! … Now transfer the chicken to a stand mixer fitted with the paddle attachment. Beat the chicken on medium-high until perfectly shredded 🙂 If you don’t have a stand mixer, just shred with 2 forks. That’s it!!!! 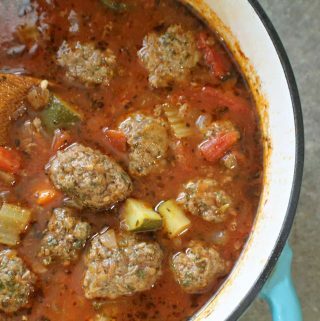 Ever since I bought an Instant Pot, my cooking world changed forever – it’s AMAZING!!! Instant Pot cooking is the easiest and fastest way of cooking by far, and shredded chicken is no exception. 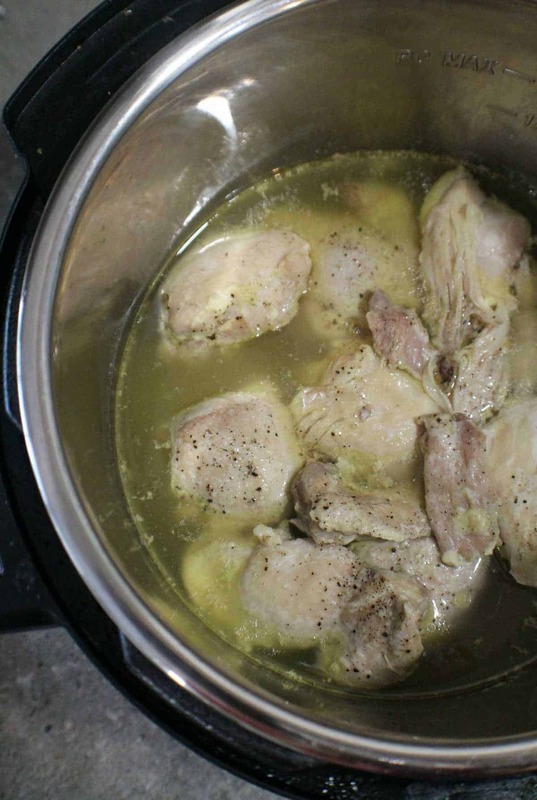 First, when making shredded chicken in the Instant Pot I always use boneless, skinless chicken thighs, not breasts. I find that chicken thighs in the Instant Pot turn out really moist whereas chicken breasts are on the drier side – especially if you’re adding them to a dish that will be cooked again. But if chicken breasts are what you want to use that’s fine too! 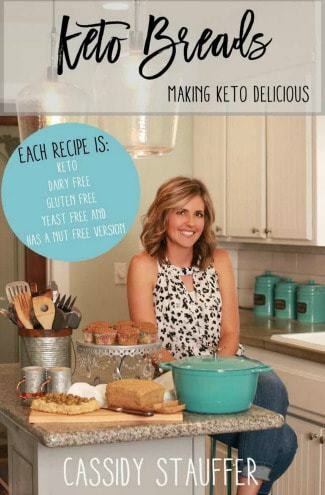 All you do is add about a cup of chicken broth or water to the Instant Pot. Then, season the chicken with salt, pepper, or any seasonings that you like and add to the Instant Pot. Once the time is up, press “Cancel” and turn the valve to venting. Once the pressure is released, remove chicken to a large bowl and shred with 2 forks. Return to the Instant Pot and toss with the liquid to keep the chicken moist… since no one wants dry chicken! If frozen, place chicken in a sealed, waterproof baggie and remove any air. Place in cold water until thawed, about 20 to 30 minutes. Be sure to keep the water under 40 degrees. 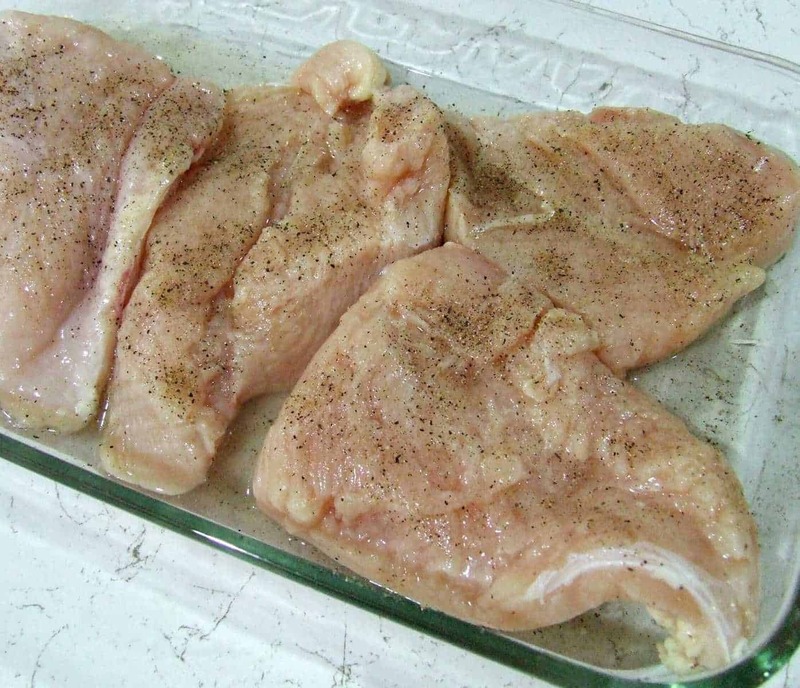 Remove chicken from water and place in a baking dish. Season both sides with salt and pepper, pour in the water, and cover with foil or lid. Bake for 25 -35 minutes, depending on thickness of chicken, or until chicken is cooked through. Transfer chicken to a stand mixer fitted with a paddle attachment and beat on medium-high until perfectly shredded. If you do not have a stand mixer, transfer chicken to a large, shallow bowl or cutting board and shred with 2 forks. Store chicken in an airtight container with the liquid to keep moist. Pour the chicken broth or water into the Instant Pot. Season the chicken with salt, pepper, or whatever seasonings you prefer and place in the Instant Pot. Secure the lid, seal the pressure valve and cook on high pressure for 15 minutes. If you are using chicken breasts and they are particularly thick, add an additional minute. For chicken thighs: Once Instant Pot is done cooking, manually release the pressure by turning the valve from "sealing" to "unsealed". For chicken breasts: Allow Instant Pot to naturally release pressure for 5 minutes. Then, release the rest of the pressure manually by turning the valve from "sealing" to "unsealed". Nutritional Information is calculated using 2 Lbs. of chicken thighs from the Instant Pot method. You can use fresh or frozen chicken for the instant pot method, it will just take longer for the Instant Pot to come to pressure for frozen chicken. For the oven method, if you use frozen chicken it will take around double the time to cook, but I’ve never tried this method so I can’t give you details on how long to cook it or how it will turn out. Sorry I couldn’t be of more help! Hi…never ever ever put frozen chicken in warm water. This is a breeding ground for bacteria. 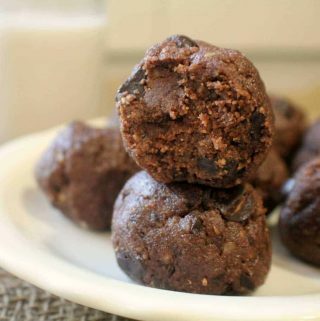 Keep it tightly wrapped, as in a ziploc bag with no air, and place it in a bowl. Trickle COLD water over it gently until thawed. Hi Elizabeth, thank you very much for your input. 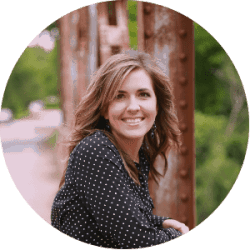 I always thought that since it thaws in less than 30 minutes that there wasn’t enough time for bacteria to grow – I had always thought it takes 2 hours for bacteria to grow. But after reading your comment then doing some research you are correct – THANK YOU! I will update the recipe to use cold water. You don’t have to thaw it! I cook mine – for a meal (don’t know why I never thought to do it this way when I need shredded chicken) – for 45 minutes at 375 straight from frozen. You just have to make sure they’re frozen *separately* and not in one big lump. 🙂 I never remember to take something out to thaw, either, so I had to figure out SOMETHING! Awesome tips Cassidy! I love making homemade enchiladas and all too often realize I am out of shredded chicken. Can’t wait to put your suggestions to use!